Last updated on January 14, 2014 August 30, 2018 by Daniel Waldron for Armagard Ltd. Need a fresh advertising idea for the New Year? Digital signage enclosure specialists, Armagard, discuss the distinct advantages of a totem digital signage unit. Transform your advertising strategy in 2014 with a totem digital signage unit, after all, digital signage is trending and creating a fresh, futuristic form of advertising that is impacting the consumer audience on an unprecedented scale. Did you know? A 2013 research study, conducted by global consumer research company OTX, revealed that 63% of adults find that digital signage advertising displays ‘attract their attention’. 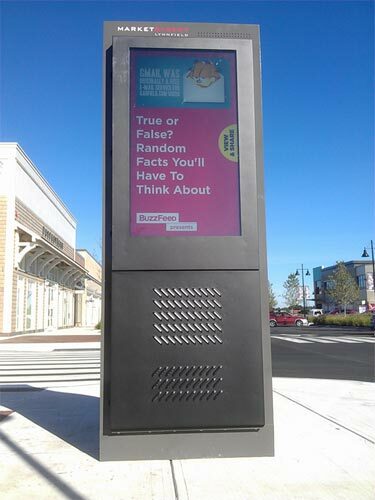 A digital signage totem provides an eye-catching focal point with which consumers can engage and interact. They can be positioned in prominent locations, both indoors and outdoors, and are proven to enhance the profile of business brands, make advertising more engaging and provoke an increased response in comparison with ‘traditional’ advertising methods. Why a Totem Digital Signage Unit in 2014? The New Year represents the ideal time to reflect on the previous year’s endeavours for any business, particularly advertising and marketing efforts. New strategies are compiled, business goals are outlined for the year and 2014 will be no different. With business markets growing ever more competitive, digital advertising continues its advance at an unrelenting pace as more and more companies look to keep-in-touch with, or surge ahead of their competitors. Totem digital signage displays have become part of this relentless advance as companies embrace digital signage on a whole new level. Digital signage totems offer a sleek and stylish solution to indoor and outdoor advertising requirements. As well as being relatively simple to install and maintain, they could prove to be a cost effective method of advertising in the long-term. Implementing your totem digital signage unit at the beginning of a New Year means that you can benefit from their impact immediately. For instance, if you’re a retail outlet, having your digital signage totem in place ready for January means you can drive more consumers to your store by advertising a ‘January Sale’. Armagard’s 55″ totem digital signage unit. Who’s On Board With Totem Digital Signage? Totem digital signage displays have been utilised by a number of service sectors, particularly those across the customer service and retail industries. Digital advertising invigorates and injects momentum into marketing campaigns, so what better way to start the New Year than with a totem digital signage unit? Rather than being fixed to a wall, or displayed from the ceiling, these unique display units can be bolted to the floor, indoors or outdoors, occupying a primary position where they’re most likely to achieve maximum impact. They can be strategically positioned to your advantage in order to achieve the best possible results in terms of interaction and engagement. Altering what’s displayed on the screen is also made easy. Changing a billboard display, for instance, requires manpower and is extremely time consuming. Uploading content onto a digital screen can be done using a memory card and allows for almost instant display. The long-term costs of digital display advertising are also favourable when compared with other advertising platforms. Digital advertising displays are not restricted by time constraints; whereas TV advertising costs for instance, stretch into the thousands allowing for a short advertising duration only. Totem digital signage displays have to endure a number of elements, both human and environmental therefore; they require a robust form of protection. A totem digital signage enclosure from Armagard provides the perfect solution. Encasing a digital signage screen, within an Armagard enclosure, ensures complete protection against human elements such as vandalism or theft. Environmental factors, especially outdoor totems, need to be safeguarded against adverse weather conditions. Armagard’s totem digital signage enclosures are designed to combat various factors that could prove harmful to your display. Armagard’s totem LCD enclosures are new to the range, a unique design concept manufactured specifically for the purpose of protecting totem displays, both indoors and outdoors. 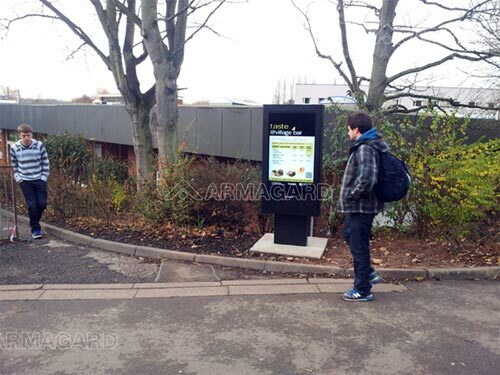 Armagard’s 47″ outdoor totem digital signage display. All Armagard LCD totem enclosures feature a shatterproof screen and can accommodate 42”, 47”, 55” and 72” LCD or plasma screens. Enclosures can also be fitted with automatic heating or air filtration devices, which help to sustain a consistent temperature within the internal environment of the enclosure, irrespective of external conditions. Such technologies prolong the lifespan and enhance the functionality of devices contained within the enclosure. The technology can also be easily upgraded in the future. Enclosures also offer a great return-on-investment and lower the total cost-of-ownership against competitors. The Armagard totem LCD enclosure is delivered fully assembled and ready for installation. So, to make a lasting impression this New Year, consider installing a totem digital signage display, complete with an Armagard totem LCD screen enclosure, and revitalise your advertising efforts in 2014. Tempted by a totem digital signage unit? Contact Armagard today! Visit our official website – www.armagard.co.uk – and complete the onscreen enquiry form. Alternatively, speak to our specialist sales team on 0121 608 7226, quoting product code PDS-47-TO-P. This entry is filed under digital advertising, digital signage, digital signage enclosure, lcd enclosure, Uncategorized. You can follow any responses to this entry through the RSS 2.0 feed. Both comments and pings are currently closed.